Oialla products are available in different varieties – several dark, a milk chocolate and cocoa nibs. Our dark chocolates consist of wild cocoa and organic cane sugar, while the milk chocolate also contains a touch of organic whole milk – nothing else. Our white chocolate is made of organic cocoa butter, milk and sugar. 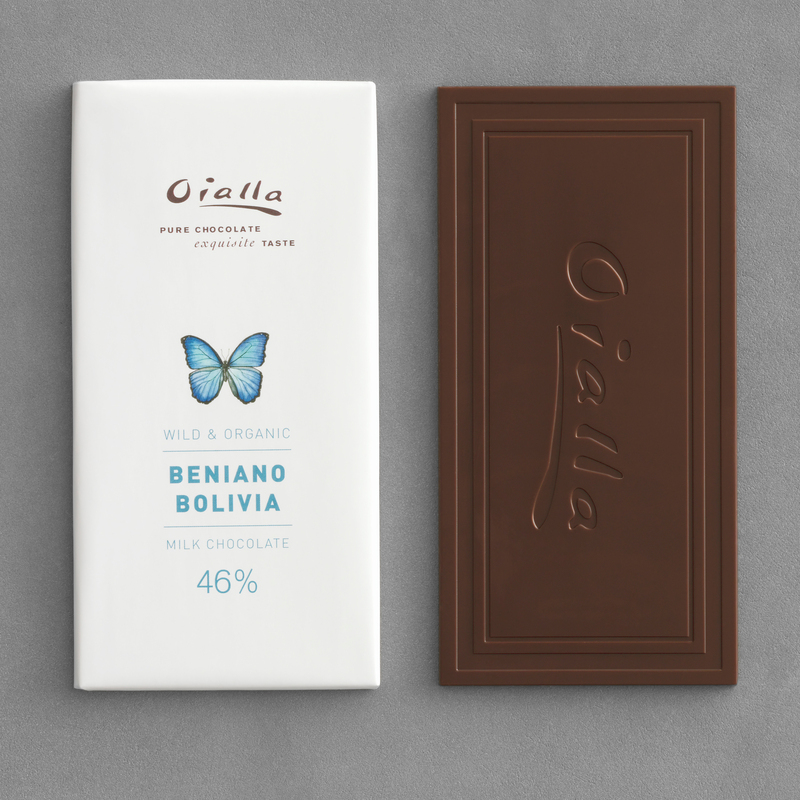 Oialla milk chocolate contains 46% cocoa, organic whole milk and Brazilian cane sugar. Compared to other, classic milk chocolates Oialla 46% contains a high percentage of cocoa, which gives it a more intense chocolate taste. Thus, it is not too sweet, and that is what makes it completely different from many other milk chocolates. Try the Oialla 46% if you are ready to challenge your concept of milk chocolate. Have a look at the entire range of 46% products, along with the rest of our Oialla products in the webshop. Oialla 72% is the first chocolate we made. It took us years of hard work to find the right balance of taste and consistency without compromising our goal of making a pure chocolate with only two ingredients – cocoa beans and sugar. 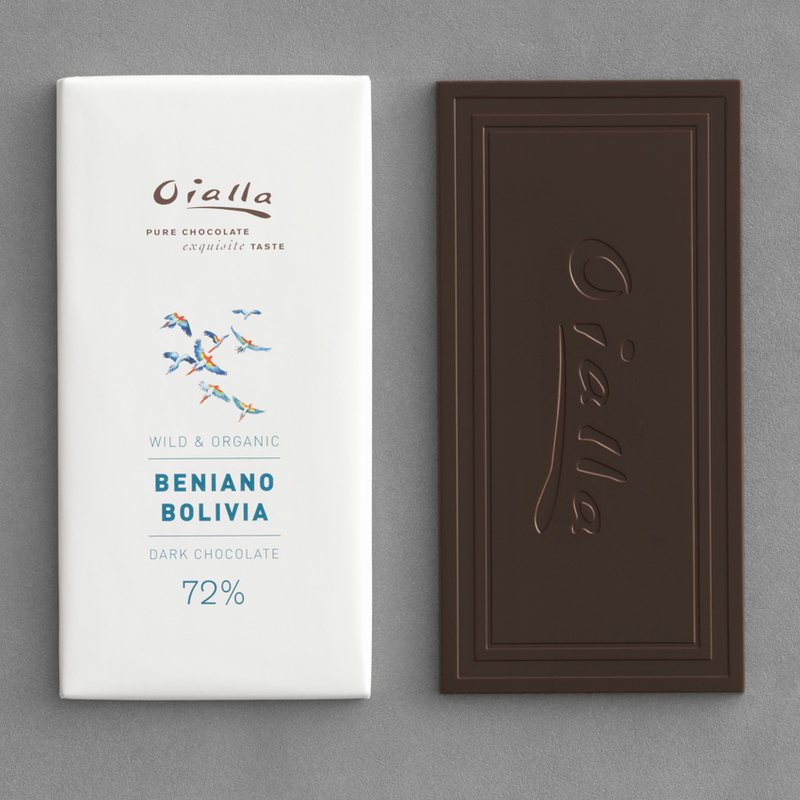 The Oialla 72% is a classic dark chocolate with a soft, exquisite and intense taste and remarkably low acidity. Have a look at the entire range of 72% products, along with the rest of our Oialla products in the webshop. 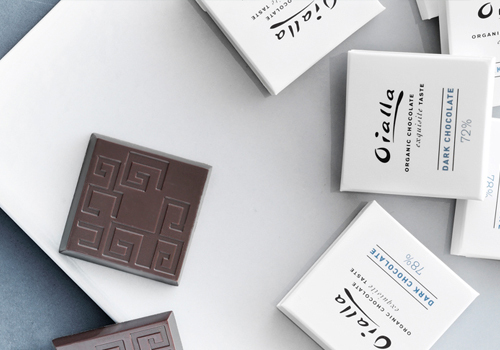 Oialla 78% is a darker version of the original Oialla 72% chocolate. The difference lies in the 6% lower sugar content and a slightly different roasting process, giving it a deeper, darker cocoa flavour. The chocolate has a low acidity and enticing notes of fruits such as peach, apricot, blackberries, prunes and red stone fruits. 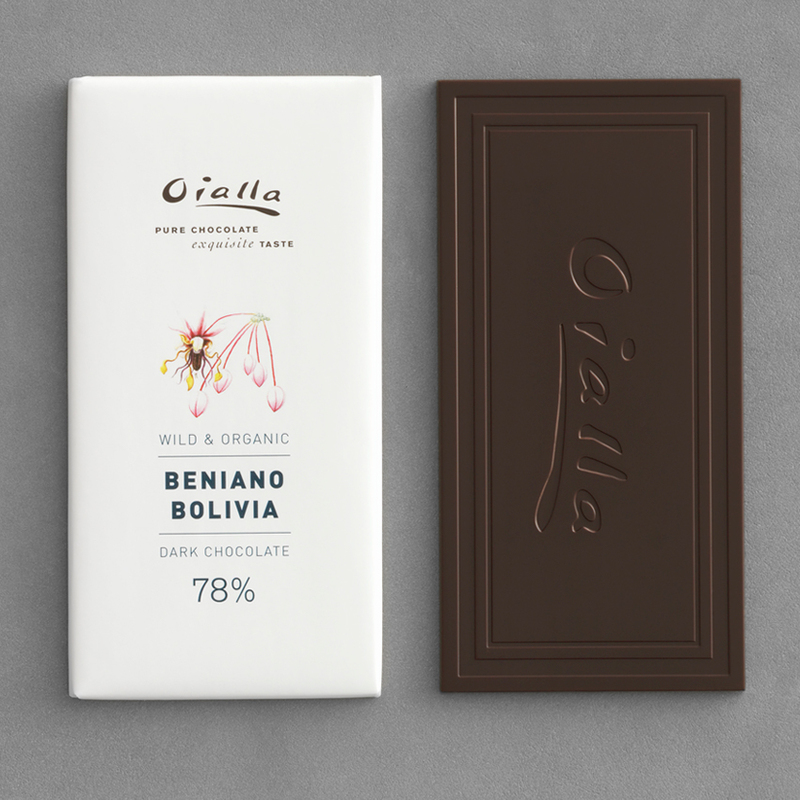 Use Oialla 78% when you want a deep, intense and dominant chocolate flavour. Have a look at the entire range of 78% products, along with the rest of our Oialla products in the webshop. Please note – Due to legal restrictions the packaging for the Chinese market has been changed, but the chocolate is exactly the same as in the rest of the world. With Oialla 100% we have made an intense and pure chocolate. We have broken it with just a touch of sugar to get a flavour that is intensely bitter with a rich cocoa aroma. 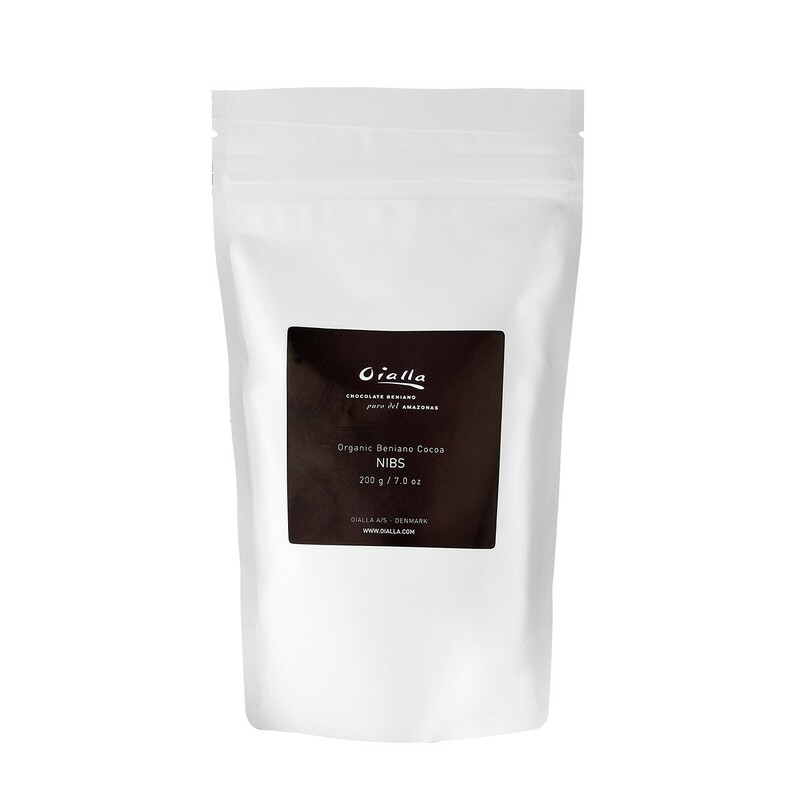 Oialla 100% is a chocolate that very much challenges the taste buds. It suits both desserts and savoury dishes as a spice or fragrant garnish – or a wonderfully rich cup of hot chocolate. Have a look at the entire range of 100% products, along with the rest of our Oialla products in the webshop. Oialla’s organic Beniano cocoa nibs are made from the same bean as our award winning Oialla chocolate. Cocoa nibs are crushed pieces of dried and roasted beans. They are excellent in cakes, in granola or sprinkled on yoghurt. Have a look at the entire range of nips products, along with the rest of our Oialla products in the webshop. Oialla is available in stores in Denmark as well as abroad.